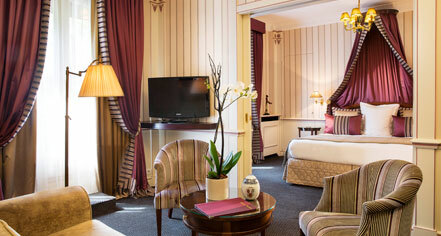 Hotel Napoleon Paris offers supreme luxury and comfort with 102 impeccably designed accommodations, including 51 intimate suites parallel to private Parisian apartments. All accommodations have been recently refurbished and fashioned in Napoleonic décor with Directoire furniture, luxurious linens, and elegant artwork. Guestrooms are adorned with a pedestal desk, flat-screen LCD television with Internet access and wireless keyboard, marbled and mahogany bathrooms, spacious tub, and hypoallergenic bath linens. Guests enjoy views of either the beautiful Avenue de Frieland or the hotel’s charming interior courtyard and flowing fountain. 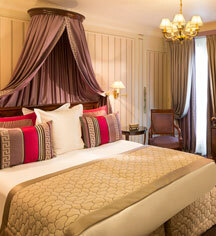 Some rooms have balconies or terraces with unparalleled views of the Arc de Triomphe or Eiffel Tower. The stunning suites exude romance with king-sized canopy beds, exquisite draperies, and peerless city views. For the ultimate in accommodations, the Hotel Napoleon Paris offers the Josephine Baker Suite, Imperial Suite, and the Youssoupov Suite.